The image you see above is an edited version of the photo that was used for the 1969 rock album Abbey Road by the Beatles. The image was edited in a Microsoft Digital Image Editor, where the members of the rock group were removed from the photo. The Beatles will magically appear when you “hover” your cursor over the image! 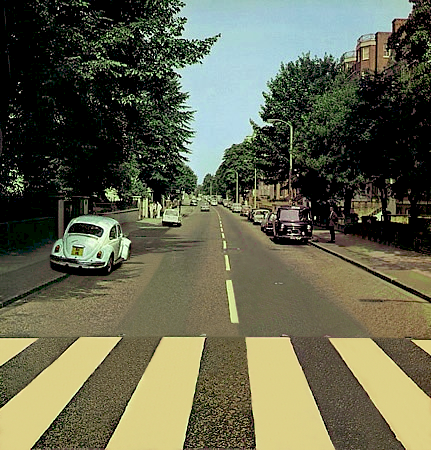 The non-hovered image above is a composite of the original image used for the album cover, taken by Scottish photographer Iain Macmillan; and this image’s white Volkswagen (and some road and curb details) taken by an unknown author. This latter photo contains many of the same vehicles, in their same locations, as are seen on the actual album cover photo; and it is therefore assumed that the photo was taken by Iain Macmillan just before or after Iain took the famous album cover photo. In a twist, the licence-plate number on the white Volkswagon in the non-hovered photo above (edited from the latter photo just mentioned) appears to be different than the licence-plate number on the hovered photo’s Volkswagon! The Abbey Road album cover photo was taken 49 years ago (from the year 2018) on Friday morning, August 8, 1969, from a ladder at this approximate spot in the middle of Abbey Road, as seen on a Google map (looking northwest). The 50th anniversary of the taking of the album cover photo will occur on Thursday, August 8, 2019. On the left side of both images up top (static and hovered), up the sidewalk a ways, are the two entrances to the EMI Studios—renamed Abbey Road Studios in 1970. Abbey Road Studios has the world’s largest “purpose-built” recording studio, and has just won the Music Producers Guild’s 2018 Studio of the Year award. Here is a Google Drive link to the original Beatles album cover image, in its full file-size, that you see when you hover your cursor over the edited version above. Here is a link to the same edited album cover image displayed above, in its full file-size, on a Google Drive web page. And here is a commemorative version of the edited album cover image, that includes a border and text—also up on a Google Drive page.